Mango season is in full swing in South Florida, and the sweet succulent fruit many call the “peach of the tropics” has a long history in Palm Beach County. The fruit, native to the Indian sub-continent, has traveled across the planet and is grown in all tropical and sub-tropical regions. 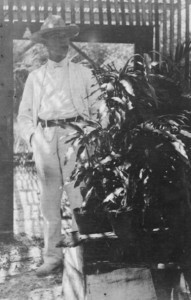 Henry Perrine was the first to attempt to grow mangoes on his immense plantation in what today is southern Dade County. Perrine had brought mango trees from Mexico, but the trees died after the plantation was abandoned in the 1830s. D.G. Watt made another attempt at growing mangoes, this time in Tampa. The trees arrived from India in poor shape; only two survived and were growing nicely, but a freeze soon did them in. Enter Reverend Elbridge Gale. Gale was born on Christmas Day, 1824 in Vermont, and became a Baptist minister. He preached in several churches, before settling in Manhattan, Kansas. 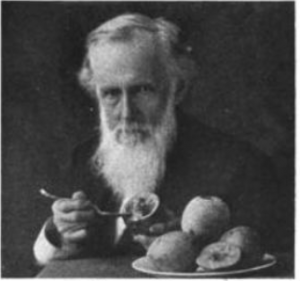 He preached until 1870, when he was offered the chairmanship of the horticulture department at Kansas State Agricultural College, where he was also chair of the Kansas Horticultural Society. His health beginning to fail, Reverend Gale arrived in the Lake Worth region in 1884 and homesteaded land in what would become the Northwood section of West Palm Beach. 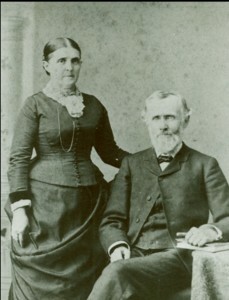 Two of Gale’s children came too; George Gale was a leading citizen and daughter Hattie Gale became the area’s first schoolteacher. The United States Department of Agriculture sent several mango varieties to the region to be grown by local farmers, including Reverend Gale. All the trees died except one – a tree of the Mulgoba variety that Reverend Gale cared for during the many freezes of the 1890s. In the late 1890s, his mango tree was the only one growing in South Florida. The healthy tree and its delicious fruit drew attention throughout South Florida, and farmers up and down the coast took seeds or cuttings from Reverend Gale’s tree. Gale was so enamored with the fruit that he named the area “Mangonia,” which survives today in Lake Mangonia and in Mangonia Park. Mango fever hit, and new residents wanted their own mango trees. John Beach, a fertilizer salesman from Melbourne, established his first nursery and began selling trees. When a freeze hit Melbourne, he moved further south to West Palm Beach and started his nursery in 1894 along Dixie Highway. Beach eventually moved his nursery west of Parker Avenue. In 1902, Captain John J. Haden planted mango seedlings he had obtained from Reverend Gale on his Coconut Grove farm south of Miami. As the trees grew and matured, one tree in particular produced a delicious fruit. The trees were tended by Haden’s wife Florence as Captain Haden had passed away only a year after planting the trees. The Haden mango was an accidental cross between the Mulgoba mango from Gale and a “turpentine” mango, a variety with poor taste and texture, but excellent root stock. The Haden cultivar is still a popular backyard variety, but disease and fungus stopped commercial production many years ago. Many other Palm Beach County growers went into the business, including the Garnett brothers in Hypoluxo, and James Miner in Boynton. Miner planted mangoes on his property where Miner Road is today along US 1, and planted trees further west along Boynton Beach Boulevard. Several packing houses shipped mangoes all over the country as South Florida was the only source of the tasty fruits. All of these larger groves have been lost to development, but mangos are still grown in Palm Beach County on a few small farms. 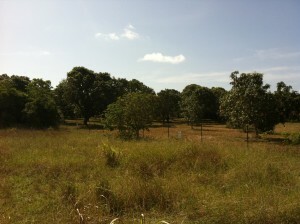 The most notable farm is “Hatcher’s Mango Hill” on Hypoluxo Road. Located on the high ridge, this four-acre farm has survived development and remains a family-run farm. John Hatcher developed the cultivar in the 1940s ,and it is most likely a cross between the Haden and Brooks mango. The Hatcher family ships the fruits by mail order all over the nation. To celebrate the fruit, Fairchild Gardens is holding its 20th Annual International Mango Festival, July 14 and 15th, 2012 at its Coral Gables location, 10901 Old Cutler Road, Coral Gables, 305-667-1651. Please see the website at www.fairchildgarden.org for a complete event schedule for the two-day festival. And next time you bite into a juicy, sweet mango, thank Reverend Gale.